One of the biggest updates in Forza Motorsport history arrives this week! The August update for Forza Motorsport 7 will launch on Wednesday, August 8 and it brings some highly anticipated features from the Forza community, loads of fixes and improvements, and a brand-new Spotlight car. In August, we’ve completely redrawn track limits for all track ribbons in the game, and we’ve given those updated track limits more clarity than ever with a new track limit illumination feature. August also brings the launch of Time Attack in Forza Motorsport 7. Any car, any class, any track – everything has a leaderboard now; this is one of the most requested features from the Forza community and we’re overjoyed to bring it to Forza 7 in August. Drifters? Yeah, we’ve got you covered too this month. As of this update, Drift Mode has received some major upgrades. We’ve got a new drift scoring model and dedicated drift leaderboards. We’re also making new drift suspension upgrades available to players and the Open Airfield is now accessible in Free Play. As always we’ve got our full list of fixes and improvements to Forza Motorsport 7 in our August Release Notes, which can be found in the Forza Forums. 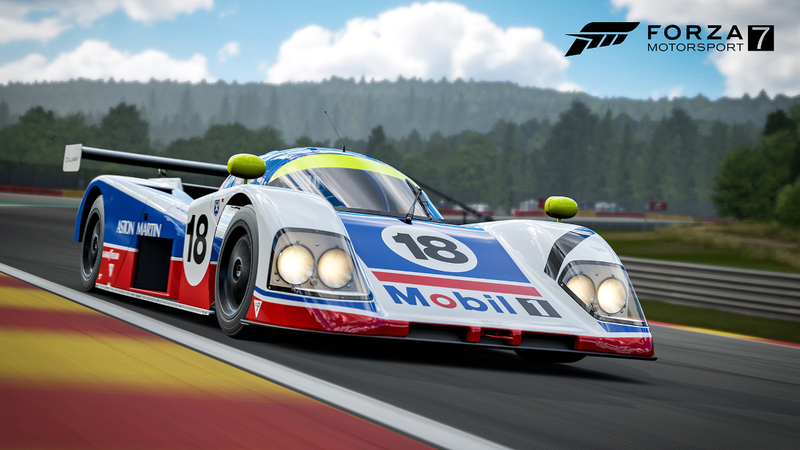 Here, we’ll dive into all the update details in August, and we start with our August Spotlight car, a classic Group C race car from the 1980s. Amidst a field of battle-hardened Group C race teams from Jaguar, Porsche and Mercedes-Benz, Aston Martin sought to enter the fray with the AMR1. Development began in 1987 with a well-funded team of designers. Aerodynamics were a key element to achieving high cornering speeds, and underneath the AMR1’s Kevlar and carbon fiber tub is a massive aero tunnel. The equally massive Aston Martin V8 was massaged by Reeves Callaway to produce more than 700 hp and was even tilted three-degrees to optimize the tunnel airflow. Only five chassis were built; the one modeled here (AMR1/04) was the most successful, achieving a fourth place at Brands Hatch and an eighth place at the Nürburgring with Brian Redman and David Leslie behind the wheel. By the end of the 10-race Group C World Sports Prototype Championship season the AMR1s had eight finishes and finished sixth place overall ahead of Toyota. The AMR1 is an astounding drive and now is your chance to experience it and build your own legendary British racing heritage. We lead off this month with a major change to track limits in Forza Motorsport 7. The team at Turn 10 have redefined track limits for all track ribbons in the game. That means hand-drawing all of those limits – from the smallest circuits like Rio Mini Circuit, to the largest tracks in the game like the Nürburgring Full Circuit. In fact, in the case of the ‘Ring, that means hand-placing more than 13,000 pins to create the splines that define both the inner and outer track limits on that famously gargantuan course. Updating track limits is a first step towards bringing our updated Forza Race Regulations feature into the game; drivers can now learn and acclimate to the new limits before regulations arrive in the game. While a good number of circuits will feel similar with the new track limits, some tracks have undergone dramatic changes. Specific examples include the second chicane on Monza, as well as the first and last turns at Sebring, both of which will play differently than they have in the past. The basic rule of thumb? Three tires over the line is considered “dirty,” whether you’re racing or drifting. Players who want an obvious clue as to where the new limits can take advantage of the new illuminated track lines feature, which we’ve implemented to help both new and experienced players understand the new track limits. These illuminated lines are can be toggled on or off in the HUD option and are color-coded for maximum comprehension (blue for safe, yellow for warning, and red when your car is considered over the edge or “dirty”). Players have the option to choose between two illuminated line styles: “ribbon” (a solid line) or “markers” (a dotted line), as well as the option to have the lines illuminated at all times or only when the car gets close to a limit line. One of the most requested features from the Forza community arrives in Forza 7 this month: Time Attack! The ultimate test for hot-lappers, Time Attack mode in Forza Motorsport 7 brings with it a leaderboard for every track ribbon in the game, across every car class, every weather option and time of day. One important note about weather in Time Attack: Although Forza Motorsport 7 features dynamic weather, Time Attack leaderboards weather conditions are static per event. This is to ensure that every player who runs a lap in that event has a consistent experience. Time Attack also brings with it a new feature in Rivals events: Training Ghost. This feature came about as a direct result of our conversation with ForzaRC drivers, who love to train against certain ghost cars over multiple laps. The Training Ghost feature lets you set a Rival before you enter an event. While participating in the Rivals event, your Training Ghost will still be present even if you beat its time. Training Ghost is a great tool for players who want to consistently race against the opponent of their choice over numerous laps. One other important note related to Updated Track Limits and Time Attack Mode: With the launch of the August update, we’ll be wiping all Rivals leaderboards beginning on August 8. The Forza drifting community is as passionate as they come, and we’re pleased to bring them some important new updates to the Forza 7 drift experience. First and foremost, we’ve added a new drift suspension upgrade option to the Upgrade Shop. This upgrade brings with it a steering angle kit that players can tune up to 60 degrees of steering angle. This upgrade includes quicker steering and optimized suspension geometry for lower camber change in steering, as well as lower Ackermann effect, reducing scrubbed loss of speed on the car during a drift. In tandem with the drift upgrades and tuning, we’ve also introduced an updated drift scoring system into Forza 7. With the August Update, drift scoring will be based on three criteria – Speed, Angle, and Line. All three of these elements will be displayed on screen with a real-time scoring information, along with your traditional drift score total. Importantly, light wall taps won’t drop your drift score and, as with the updated track limits in traditional races, getting two wheels out of the track limits (such as both rear wheels, for example) won’t drop your drift score. Another important change: Drift zones have been completely removed from tracks, which means you can now manji drift down straights and earn drift score, and you can also completely link a track together with a single drift. In addition to the big changes listed above, we’ve got additional changes that we think our community will love. For example, players can now save and load race configurations in Free Play, Split Screen, and Private Multiplayer lobbies. Once a lobby is set up, players will have the option to save those settings and give it a unique name. Players can save up to 300 named Race Setup files and, if you join an Private Multiplayer lobby, and like the options that the host has configured, players can save a copy to keep for themselves. The Open Test Track Airfield is now available in single player! Players can find this favorite test ground in the Free Play/Test Drive game type – no laps, no time limit, just hooning to their hearts’ content. We’ve made lots of improvements in multiplayer, including introducing Spectate Ticker options for new multiplayer race types. In addition, players will now randomly shuffle between classes after each race when racing in the ABCS Multiplayer hopper. 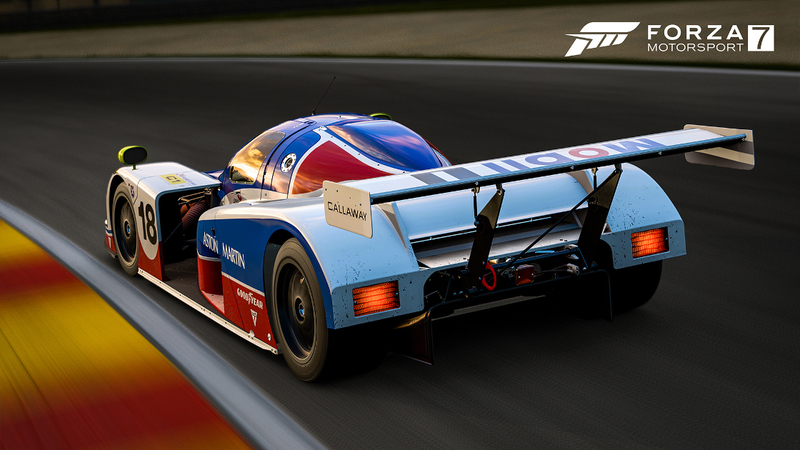 Put your shiny new Aston Martin AMR1 to the test in our Spotlight Rivals event in August. You’ll pilot the #18 car around Suzuka Full, a track that demands the most of both car and track alike. Elsewhere, we’ll have a new Bounty Hunter event, and drift Rivals events galore. In addition, look for a new Bounty Hunter event coming later in August! The next Forza Motorsport 7 League season begins in mid-August and we’re calling it “Hard Charging.” Grand prix fans will be well served, with Open-Wheel Legends and Formula 90s Division events, and drifters can look forward to a Ghost Drift event featuring rear-wheel-drive cars during the week of August 19. Another eclectic month of #Forzathon events arrives in August, challenges from all corners of the motorsport world. We’ve got drifting events, featured divisions like Vintage GT racing, Forza Specials, and Major Micros, as well as an event dedicated to Time Attack Rivals events. Great rewards are available for completing these events, including the Ferrari 250 LM, Think Pink Driver Gear, and more. Be sure to check out the #Forzathon tab in the main menu to keep up to date with all of the latest.